Glocal medical college was started from the 2016-17 academic year after obtaining approval from the overseeing committee of the Medical Council of India. Amongst others, twenty-four students were admitted in the first year MBBS course during 2016-17 under the government quota via NEET counselling. While the college did get one year respite, the students alleged that its likely to fail any MCI inspection owing to its severe dearth of infrastructure. The medicos have now written to the MCI, Uttar Pradesh Chief Minister seeking intervention in the matter. Most of the private medical colleges lack in basic and necessary facilities for students as well as patients. Greatest deficiency is of regular faculty and secondly patients are deficient as per MCI norms. BOG of MCI should seriously think and take necessary action regarding the way private medical colleges are running now a days. It is damaging the quality of medical education and thus responsible poor health services to the society. I appreciate some recent decisions of BOG of MCI regarding LOP and and hope they will take several more quick and necessary steps to improve quality of medical education. 90% of Faculties in any private medical College are ghosts who turn up on the day of inspection, remaining 10 carry the burden of teaching and treatment. I fail to see why online monitoring of faculty has been not implemented? 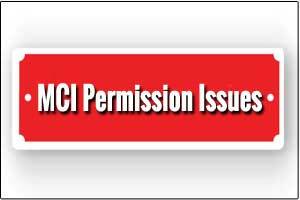 Why this meritorious project has been shelved and MCI is acting in cahoots with forgerers and quasi criminal ghost Faculty? Would you mind clearing your point.